On December 21, 1761, Governor Josiah Hardy assented to legislation establishing Sussex Court House and Jail on lands of Jonathan Hampton, on or within a half-mile of Henry Harelocker's plantation. Building managers Abraham Van Campen, Jacob Starn, and John Hackett were appointed in May 1762 to supervise the construction work. As the Court House was rising on its present site at the intersection of the Easton and New York roads, landowner Jonathan Hampton laid out a Town Plot with building lots fronting a Court House Yard or Public Green, which served as a grassy commons for public meetings, township elections and militia trainings. Jonathan Hampton donated 2.8 acres to the Board of Chosen Freeholders for the Court House Yard & Green on August 31, 1764. After three years and an expenditure of £2,100, the new building was ready for occupancy in May 1765. (Middle picture to right) Built of stone, Sussex Court House included a large Court Room, living quarters for the Sheriff and his family, and a Jail at ground level with several cells. The jail entrance was situated under the steep double stairway leading to the Court Room door. An iron weathervane in the shape of a banner, with the cut-out date "1765," (top photo to right) was planted atop the steeple. On May 10, 1780, Loyalist Lieutenant James Moody led six men from Staten Island on a daring raid to free eight prisoners held in the Sussex Gaol on various suspicions and charges of loyalty to the British Crown. Hearing a knock in the dead of night, the Sheriff called down from the upper room, asking these shadowy figures their business. Lt. Moody replied that he had captured a notorious Tory, who was one of Moody's men. Though seemingly delighted, the wary jailer refused to open the door. Moody then identified himself and threatened to pull down the building. With loud Indian war hoops, his small troop alarmed the sleeping villagers. Meanwhile, Lieutenant Moody gained entry through a casement and succeeded in releasing the prisoners. Despite a spirited pursuit lasting several days, the militia failed to capture the raiders. The Board of Chosen Freeholders appropriated $800 in May 1801 to build a "Fire Proof" Clerk's Office "of Stone except the arches which are to be built of brick." It measured 28 by 18 feet. 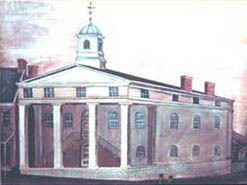 The Surrogates's Office, 22 feet in length, was added at the east end of the Clerk's Office in 1825. The dilapidated and crowded condition of the old Court House prompted considerable talk of removing the county seat to Augusta. 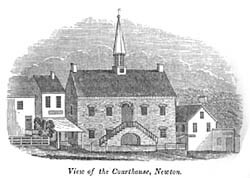 To allow for much needed repairs, the Sussex Courts opened in the Newton Methodist Church on Division Streeton August 20, 1844. Under the supervision of master carpenter Amos A. Harrison, the ancient structure was raised another story, coated with stucco, capped with a handsome new roof and cupola, and ornamented by the addition of a Classical portico with massive Doric columns in front. The remodeling was done in time for the Sussex Courts to hold their November sessions here. The appearance of the Sussex Court House, as remodeled in 1844, is known only by an oil painting (bottom picture above), which was based upon a rendering of the building on the old tavern sign of the Durling Hotel. A picket fence enclosed the Green between 1845 and 1872. Ornamental trees were first planted in 1849.
give a Court room amply large enough for the want of the County. On March 15, 1847, the contract for building a new Court House was awarded to Samuel Fowler and Moses R. Andrews, of New York, for the sum of $13,000. Amos A. Harrison, supervising architect, was paid $207.90. Amos Harrison did the carpentry work and General Lyman Edwards put on the tin roof. They brought some sailors from New York to take down the old steeple. The old iron weathervane was sifted from the ashes. Mahlon Hurd, John Struble, and John Slockbower did the mason work, while Robert Gray presided at the mortar bed. Sheriff Andrew Shiner was the general boss. Another attempt was made in May 1847 to suspend work and chose a new location, but the motion was defeated. Sheriff Osborne occupied the new building, built upon the old walls, on April 1, 1848. On May 1, 1848, the Sussex Courts opened in their new quarters. In May 1848, the Building Committee reported that $14,583.48 (out of an appropriation of $15,000) had been expended on the new building. stone. The stone wall and terrace below the Court House were completed in May 1874. Two more windows were cut into the front in 1885. In March 1910, a new bird house, double in size, took place of old house on roof of the Court House. It has 62 apartments and was designed for purple martins. The Clerk's and Surrogate's Office was declared "unfit for use" in 1859 and the Board of Chosen Freeholders appropriated $3,000 in May of that year to build new offices. The old building, which stood on the Green, was demolished in August 1859. Contractors Brink & Knox completed the work in June 1860, constructing a cross-gabled, one-story office of brick. In 1872, the County Park was enclosed by a fence of posts and chain and a stone wall, two feet high, was built on the lower side with rings in the wall for hitching horses. County officials first restricted pedestrians to the present walkways in 1889, planting grass and forbidding political gatherings. Mason John Biggs raised the stone wall on the lower side of the Park in October 1891. The Civil War Monument and the Hill drinking fountain were erected in 1895. A "Formidable" cannon and stack of cannon balls were placed on a concrete base in October 1905. Tar rock walks were installed in 1908. 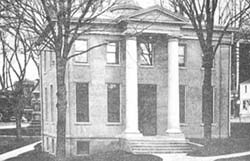 The Freeholders awarded the contract to remodel the Surrogate and Clerk's Office in the County park to contractors O'Donnell & McManiman in July 1907. According to the design of architect J. J. Vreeland, of Dover, the old building was raised to two stories, requiring the addition of 8 feet to the original walls. The building was treated "in the Renaissance order of architecture." A metal cornice and tin roof were installed. The entrance porch, 8 feet wide, was flanked by "two large Gothic columns." The corridor was furnished with "a paneled ceiling and marbleized metal wainscoting 4 feet high." A metal ceiling, tarazza floors and fire-proof window frames safekept the documents stored in teh Clerk's vault. An oak staircase rose to the second story, which included a large toilet room, center hall, the Surrogate's Office and the Freeholders' Meeting Room. The improvements were completed in March 1908. With the completion of the County Hall of Records in 1930, the former offices of teh Clerk and Surrogate were renamed the County Park Building. In 1931, the Freeholders awarded contracts to alter the first floor, formerly occupied by the County Clerk, for use of County Engineer Harvey Snook. At that time, two windows were installed on the Park Place side of the building. On December 29, 1910, a fire damaged the courtroom and attic of the Court House, wrecking the cupola. In April 1911, contracts worth $7,461 for improvements to the Court House were awarded to Thomas Farrell, carpenter, and to ODonnell & McManiman, masons. The interior of the main court room was extensively redecorated: the Judges desk, bar doors and trimmings of the main court room, the Judges, Counsel and Pettit Jury rooms and hallways were made of red gum wood. The main body of the room with high-backed benches were supplied by Fitzgerald Spear Co. of Penn Argyl. Old-style windows were replaced with plate glass windows, one glass pane to each sash. NEW ADDITION: Coming up on 20 years on the fight to save the court house and the surrounding streetscape. Included here a 2.1 mg pdf file of newspaper clippings from that time period. Need Acrobat Reader to open file.  D.Powell. Copyright 2000 Kevin W. Wright. All rights reserved.